The Remington RP9 9mm +P, striker fired pistol is one of Remington's turning point guns ..... kinda. After a significant period of quality control questions that are ramped up by internet hysteria, the company is due some serious corrections. They have to put up some real proof they can pick up the slack on the let down on a long tradition of some of the country's favorite firearms. It's important for Remington to turn the public discussion from one of questioning anything new they produce. Back to one of anticipation and excitement about their newest offerings. 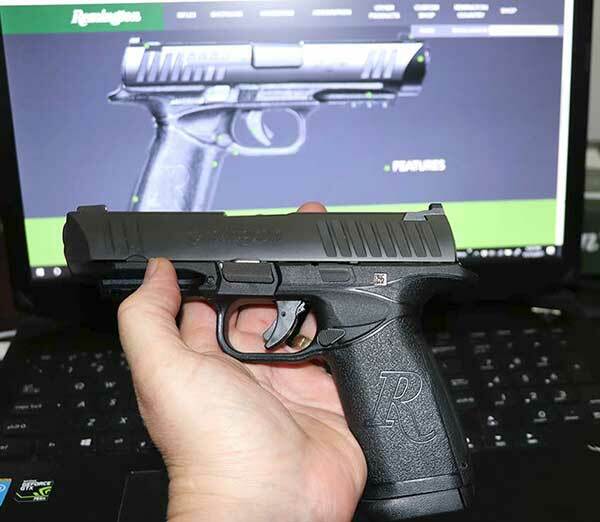 The Remington RP9 pistol has been harshly questioned and criticized ever since it hit the market; often by people who have never touched one. But I found that trusted sources who had actually tried the gun were giving it solid, rave reviews. So, when I saw one available in my employer's gun showcase, at a price that made it not even worthy of concern, I filled out the paperwork and took it home. The Remington RP9 striker fired pistol is a big, duty size pistol. But big doesn't mean unduly heavy. The polymer frame lightens what would be a chunk if it were metal alloy. As I always do, I took the gun apart on getting it home. What you find is absolute beef as far as the construction of the slide. The bottom side of the slide where it meets the frame is wide, heavy, and solid as granite. I held it up next to the slide of my S&W M2.0 and was shocked at the difference in the width of the metal. Without a doubt, the Remington RP9 is intended for heavy duty action. It was ready to go in the box. Clean, lightly lubed. Nothing else needed before shooting. I wanted to put this gun through its paces, so I took several kinds of ammo, and plenty of it. Headed to the range with a usual combination of wood, splatter, paper, silhouette, and steel. The ways I would shoot it would be to test for accuracy, straight speed, and multiple target acquisition. In all that I wanted to shoot enough, and diverse enough ammo to see it machanically perform. I wanted to see if my new gun would stand up to my GLOCK, S&W M2.0, Canik, all guns worthy of admiration in their construction and perfomance. I set up my targets and got started. First the silhouette from about 35 feet. Slow firing for accuracy at the head of the silhouette. Right out of the box, the wind adjustable, white dot sights were on target. All rounds I had loaded went in the head. Several landed in the same hole. Having the gun in my hand shooting it for the first time, I shot slightly left on the first few shots, but straightened them out after quickly getting a feel for the gun. Good to go for accuracy. After some more practice with other targets I was ready for some fast, straight, steel silhouette shooting. The Remington RP9 9mm was a pleasure to shoot. It can be mentioned at this point, that Remington got the message from other gun manufacturers. 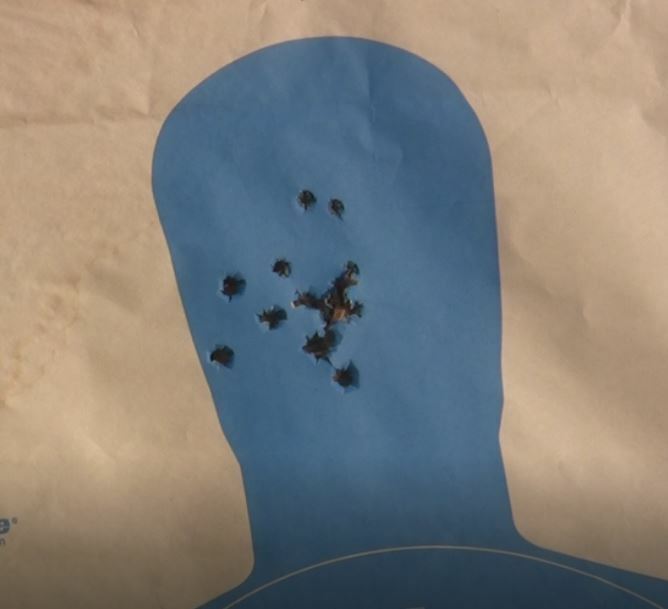 The trigger on the gun, while having a different feel from my other guns, still had a short, crisp trigger pull that allowed fast center mass shooting on the steel silhouette. That led to some fast, mulitiple target acquisition. That meant shooting three steel targets lined up to allow shooting back and forth between them, simulating dealing with three approaching attackers. It was a breeze with the short trigger pull and my rapidly building confidence in the big pistol. Moving as fast as I could back and forth between the targets, it was clear three attackers could have been dealt with handily with the RP9. See the video below to see the type shooting performed at steel targets. After over 200 rounds including Winchester ball ammo, forged steel case fmj rounds, and self defense hollow points it was clear the gun was manufactured to perform. The gun comes with 3 back straps to adjust the grip. 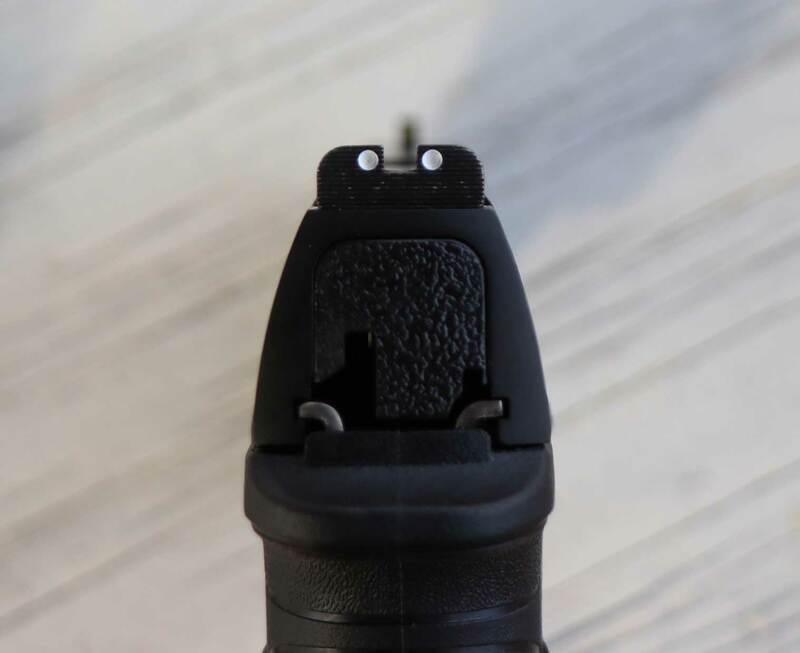 If you're used to using a GLOCK or M&P you'll immediately notice the difference in reach from the grip to where your finger naturally falls on the trigger. It's different and at first it felt odd. But after a bit of adjustment and practice everything fell into place nicely. I was able to confidently pull off anything I'm able to do with my most practiced pistols. The controls on the RP9 are in the usual places. The take down lever is the big one in the forward position on the frame. Downside to the whole take down process is you have to pull the trigger to get the slide off. Not a deal breaker, but not desirable in any gun. The stippling on the gun is smooth, but effective for a reasonably solid grip. The trigger guard is slightly undercut, and helps achieve maximum depth of the gun in the web of your hand for rock solid shooting. The sights are typical white dot, that on this gun were set to go for accuracy out of the box. The sights are adjustable for windage. It's likely they'll be ready to go when you get the gun, but it's nice to know they can be adjusted if needed. For this type sight, the dots are adequately sized and clear to the eyes. I haven't looked into accessories for the RP9 just yet, but with the dovetail inserts, there will likely be plenty of aftermarket options for sights. Keep in mind I don't have guns sent to me by manufacturers to see if I will give a boost to their firearms ratings. I buy my guns, shoot and otherwise test them. I report on how they work for whatever amount of time I have tested them in, whether an initial range report, or months of range work and carry. I know how to shoot, what should happen when I put a gun through its paces, and how it should perform. I report on those primarily. Everything else is opinion and preference. That's the way to approach any gun review. As an anecdote of the reviewer. This gun is an offering by Remington, that appears to be a practical, duty size competitor with GLOCK, S&W, Ruger, Walther, and others. 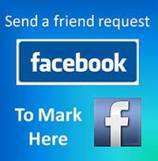 They have put everything in place to make the gun work and operate for a wide range of users. Trigger Pull: Instead of manufacturer stats - From Wheeler Pull Scale - right at 6lbs. Trigger pull is short, crisp, with short audible reset. Avg Weight (unloaded): 26.4 oz. The only external safety on the gun is the one built in to the trigger. 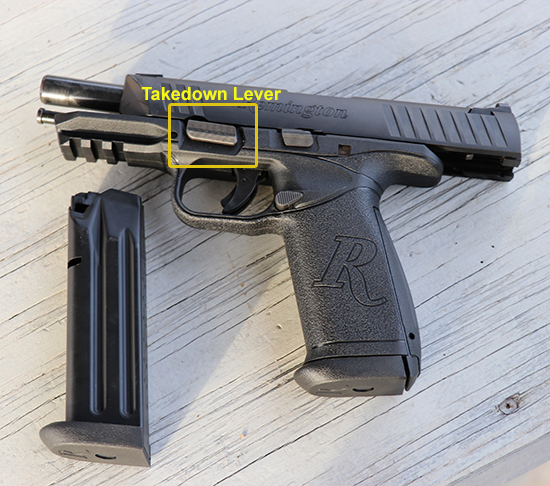 The slide stop is just that, not a reliable device to release the slide with when reloading. Not that it won't work, but it's almost flush to the side of the gun and like many other models now, the gun is intended to be slingshot readied rather than with the slide stop. 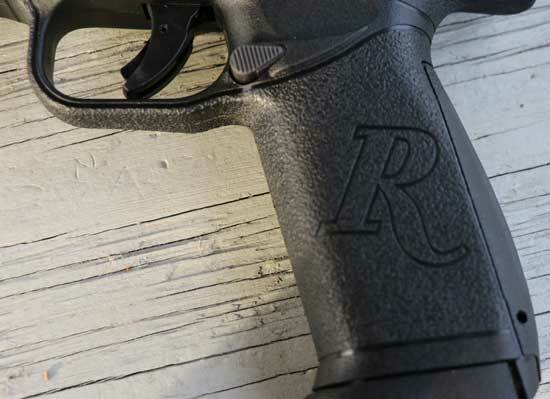 Bottom Line on the Remington RP9: Remington built a winner in this handgun. Not just because I tested it and say so. Because multiple trusted sources have put it to work now, and provide their input on the solid performance of the gun. This gun and any other coming on the market now, should be evaluated from reviews that report on how it works, not just the preferences and whims of the reviewers. 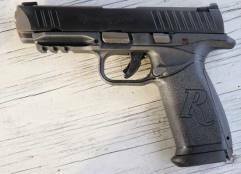 The Remington RP9 9mm +p: A handgun that will likely take its place among the current popular herd of striker fired 9mms that definably work for what they were created for. A gun that is presented to the public at a price point that makes it stand out, and hard to resist, even when comparing it to the historically known best of the best. I hope Remington is stepping back up to the plate to do what they've done for generations. Create guns that people anticipate in production, want in stores, and use in real life. UPDATE: Quite a few people have expressed concern about the ongoing reliability of the RP9; but after shooting it a bit more, it appeared to be rock solid. So, I decided to pick up some fringe ammo and do the video below. In the vid I put 100 rounds of Winchester Forged Steel Case ammo, and 100 rounds of Independence aluminum case ammo through it as fast as I could load the mag and get it shot. Worth seeing for added confidence that the particular gun I own is reliable. Remington RP9 Test Round Two from Christian Gun Owner on Vimeo.